CSR has now moved beyond the stage of specialist or niche subject to become an integral part of global business and society. This timely edition is destined to become the definitive guide to CSR, Sustainability, Business Ethics and the organizations and standards in the field. 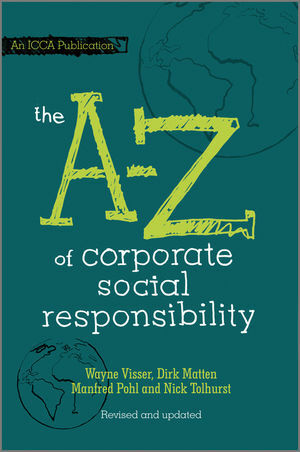 The A to Z of Corporate Social Responsibility is a unique publication and is the culmination of over a hundred of the world’s leading thinkers, opinion formers, academic and business people providing an easy-to-use guide to CSR: from general concepts such as sustainability, stakeholder management, business ethics and human rights to more specific topics such as carbon trading, microfinance, biodiversity, the Base of the Pyramid model and globalisation. In addition to definitions of the most important terms across the wide range of CSR associated topics, this book also covers all the most important codes and guidelines, such as the Equator Principles, the UN Global Compact and ISO standards, as well as providing background on organizations such as the World Business Council for Sustainable Development and Transparency International and profiles of CSR in particular industries and regions. This paperback edition includes all the latest developments in CSR as well as incorporating new sections on boardroom pay, the sub-prime market and the financial crisis. Dirk Matten, Hewlett Packard Chair of Corporate Social Responsibility at York University Business School, Toronto. Wayne Visser Founder and CEO of CSR International, London. Wayne He is Visiting Professor in CSR at Manheim University (Germany) and Senior Associate and Internal Examiner at the University of Cambridge Programme for Industry (UK), where he previously held positions as Research Director and External Examiner. Manfred Pohl & Nick Tolhurst, ICCA, The Netherlands. The A to Z of CSR – Introduction (Wayne Visser and Dirk Matten).